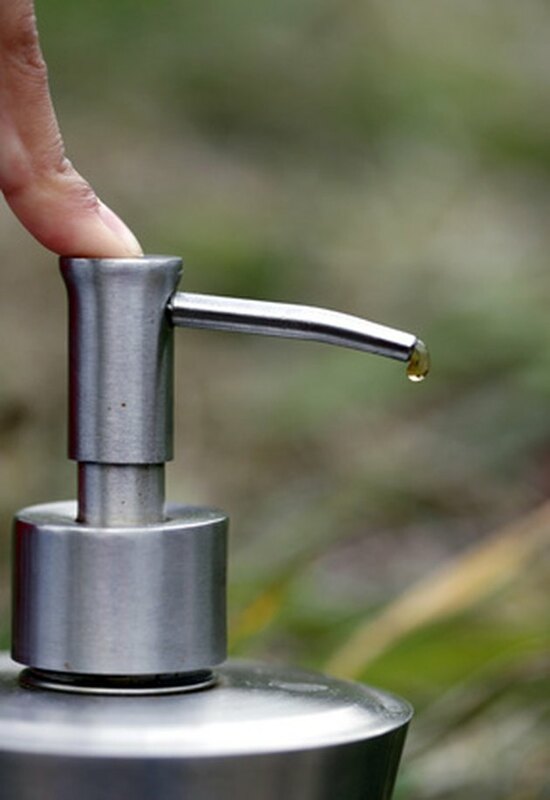 Nothing is worse than having soil-covered, paint-covered or food-covered hands, reaching for the soap dispenser, then nothing comes out. Or, just as bad, the soap squirts out in some strange direction and misses your hand completely. If this happens to you, you probably have a clogged soap dispenser pump. The good news is that it is easily fixed, and you'll have your soap back in no time. Keep your soap dispenser clog-free. Fill your sink with warm water, and add 1 tsp. bleach to the water (to sanitize your pump). Remove the pump from the dispenser (usually they screw on and off of the main dispenser). Place the pump into the warm water and allow it to soak for 15 minutes. Turn on the faucet and allow the warm water to run. Hold the pump under the water for a minute or two. Push the nozzle of the pump several times while holding the pump under the running water. The goal is to purge any old soap from the pump until clear water squirts out. Insert a pipe cleaner into the clear tubing of the pump to clear away any clogs that the water did not clear away. Then repeat Step 6. Place the pump back onto the main soap dispenser and use as you normally would.